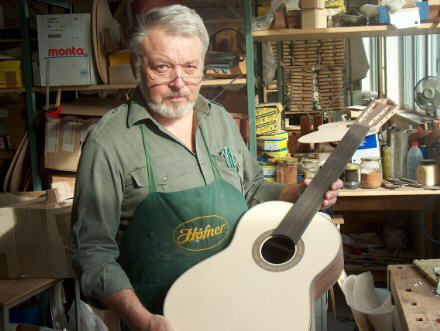 Dieter Fischer holding an HM88 classical guitar that he is working on. The photographs contained in these pages were taken by Rob Olsen (The Music Group Inc, USA,) when he and Graham Stockley (Besson Musical Instruments) visited the Hofner factory recently. I believe that they illustrate the craftsmanship, individuality, and personality that is built into the current Hofner instruments. The pictures do not show huge production lines associated with "big name" guitar manufacture, but do show luthiers personally making guitars in the old style. Remember that these are not posed glossy catalogue photographs. They show what was actually happening at Hagenau when Rob and Graham called by.